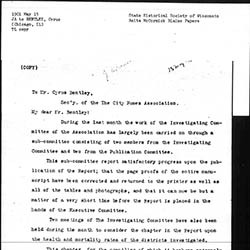 Addams provides Bentley with an update on the work of the Investigating Committee of the City Homes Association. 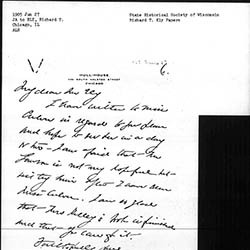 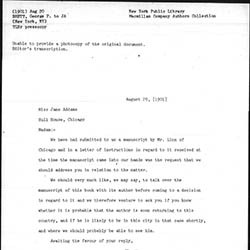 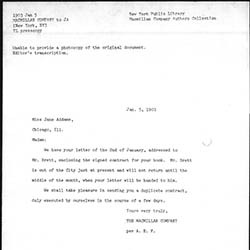 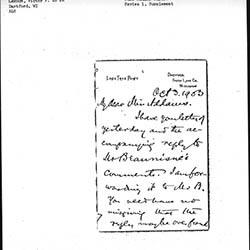 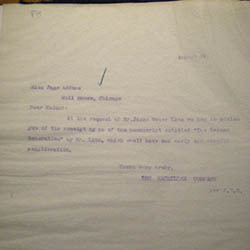 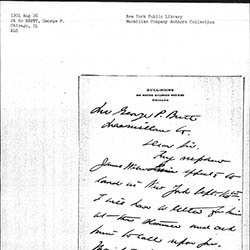 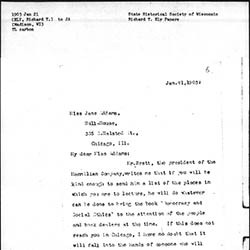 Addams writes to Kelley about John Kelley's visit to Hull-House and work done to publish portions of her manuscript. 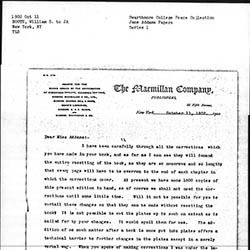 Addams advises Brett of the Macmillan Company about the return of John Linn to New York. 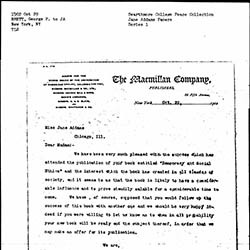 Booth apologizes to Addams for the publisher's neglect of her corrections for the second printing of Democracy and Social Ethics. 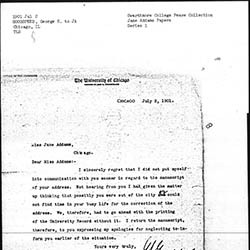 Booth asks Addams to limit the number of corrections for the new printing of Democracy and Social Ethics. 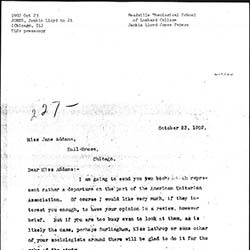 Brett congratulates Addams on the success of Democracy and Social Ethics and extends his hope that she will write a second book. 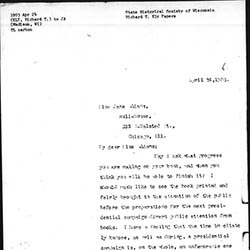 Addams discusses the pace of writing Newer Ideals of Peace. 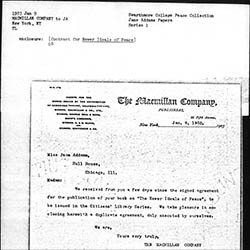 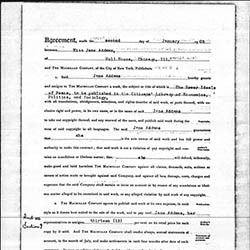 Publication agreement outlining the financial and publishing details for Addams' The Newer Ideals of Peace. 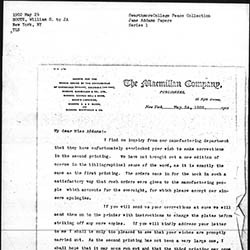 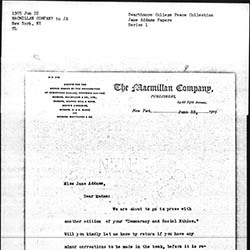 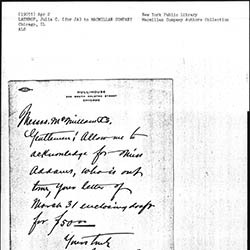 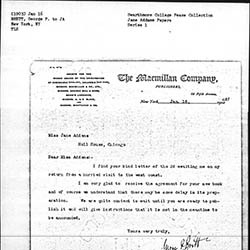 Macmillan Company notifying Addams that they have enclosed the contract for Newer Ideals of Peace. 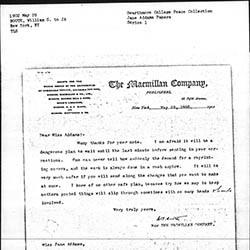 Macmillan Company sends Addams the contract for Newer Ideals of Peace. 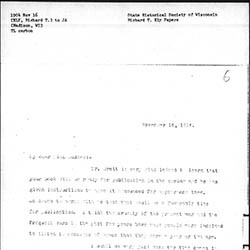 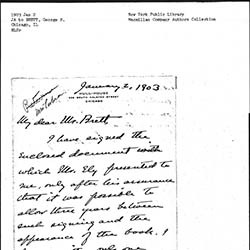 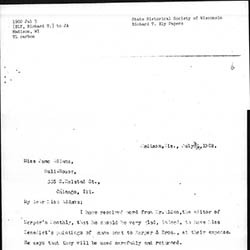 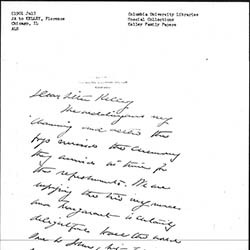 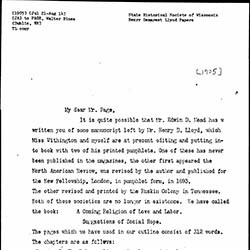 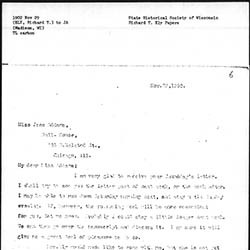 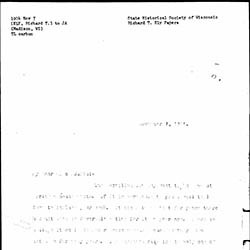 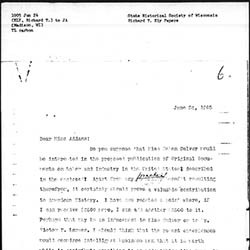 Richard T. Ely writes to Jane regarding publication dates for Newer Ideals of Peace. 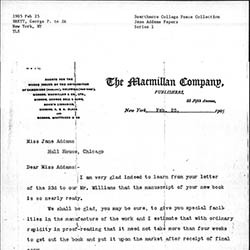 Addams responds that she has contacted Helen Culver about Ely's request but is not hopeful about Victor Lawson's willingness to support the project. 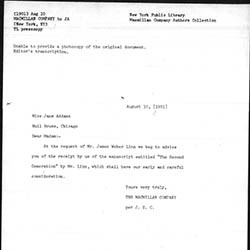 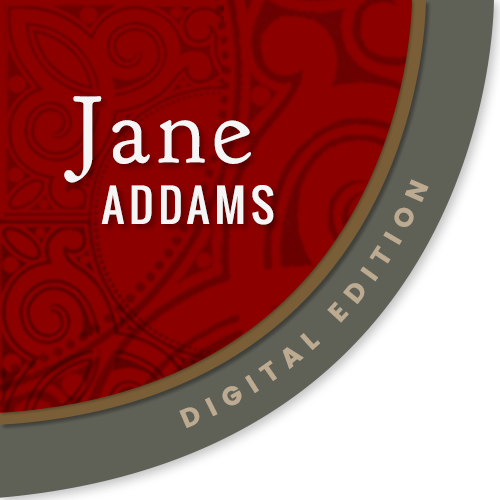 Addams writes about a manuscript by Henry D. Lloyd which she is editing with Anne Withington.